Lean, mild fish like john dory give you the most latitude when it comes to cooking techniques, but the best methods preserve its natural attributes -- fine texture and light flavor. Flavor-wise, dory needs less than five ingredients to go from mild to wild and everywhere in between. A drizzle of olive oil and lemon juice after pan-searing keeps everything fresh, fast and vibrant. Flash marinating and steaming adds a touch more flavor to dory but doesn't change its texture. Roasting the dory with aromatic and pungent ingredients leaves you with a bold jus that doesn't overpower the senses. Heat a few tablespoons of oil or equal parts oil and butter in a saute pan on the stove over medium heat. Season the dory on both sides with kosher salt and freshly ground black pepper. Sear the dory fillets skin-side down in the pan until the edges start to curl, about 2 1/2 to 3 minutes. Occasionally, tilt the pan toward you and spoon up some of the fat and pour it over the dory. Turn the dory over with a fish spatula and cook until the flesh firms and flakes, 2 1/2 to 3 minutes. Transfer the dory to a plate. Make a quick pan drizzle using the fat in the pan. A squeeze of fresh lemon juice and a scant palmful of capers heated through in the fat and drizzled over the dory takes just a few seconds and adds just enough brightness to highlight the dory's mild flesh. A splash of cream, freshly ground black pepper and some fresh herbs make a quick and creamy sauce that tastes like it took much longer to put together. You can put nearly any ingredient in the pan drizzle as long as it cooks quickly and you heat it all the way through. Spoon and drizzle the sauce over the dory fillets and serve immediately. Marinate the dory fillets for 15 minutes in olive oil, food acid and herbs. Steaming doesn't incorporate much flavor by itself, but a 15-minute soak in an acidic herb marinade imparts enough flavor to detect but not enough to overpower. Don't marinate the fish for more than 15 minutes, or you'll lose the texture steaming preserves. Add aromatics to a pot of water. Fish-friendly aromatics, such as fennel fronds, dill and a few black peppercorns, lightly perfume the dory but won't add aggressive flavor. Place a steamer basket in the pot and bring it to a boil with a lid on it. Season the dory fillets with kosher salt to taste if you didn't use a salty marinade. Place the dory fillets in the steamer skin-side down when you hear the water start to boil. Cover the pot and steam until flaky, or 8 to 10 minutes, then transfer it to a plate. 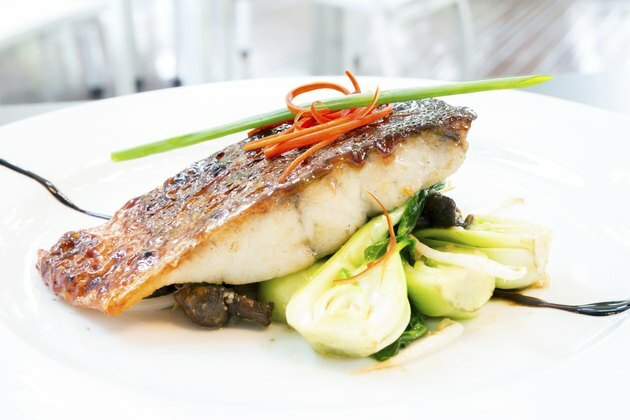 Drizzle the dory fillet with melted butter or olive oil and a squeeze of the lemon juice before serving. Steaming doesn't add any fat, so a touch of butter or oil adds a smooth mouthfeel without any heaviness. Heat the oven to 350 degrees Fahrenheit. Season the dory to taste with kosher salt and freshly ground black pepper. Place the fillets in a shallow dish with a few pungents and acids. The flavor of pungents, such as shallots, and acids, such as teardrop tomatoes, concentrates during cooking and makes a bold accompaniment for the dory later. Coat everything with a thin layer of olive oil and slide it in the oven. Roast the dory until it flakes easily, about 10 to 12 minutes, then transfer it to a plate. Scoop the pungents and acidic ingredients from the dish and spoon them over the fillet. Finish with freshly chopped herbs and serve.